India won the match is known news but what actually India gained from this victory was the confidence of winning matches without their star players. Yesterday's win over Kiwis was the perfect example of team work. Every member of the team contirbuted in the win. Batsmen did their job, bowlers showed their skills and fielding was also very good. I must give special mention to Virat Kohli. Kohli scored his second consecutive century and this century was his first in setting up the target. He played his shots freely and never looked under pressure. After this knock of Kohli, some news channels compared him with Sachin Tendulkar but I feel it is unfair to compare him with God(Sachin) because this will put unnecessary pressure on this young lad and if in next few innings he fails then that can go against him. Kohli and Yuvraj SIngh partnership gave India the platform to score big. I feel Yuvraj Singh who was playing well was unfortunate to miss out on half century but never the less he did his job and given the signal of coming back into the form and that is great news. After Yuvraj, Raina joined Kohli but Raina carried his bad form into this match as well and failed again by getting out on personal score of 13. Later Yusuf Pathan played few shots and ensure India a score of more then 270. Alarming sign for India was not playing the entire 50 overs after getting great platform from top-order and India have to work on this quickly because not playing entire 50 overs is a crime in ODI. Andy Mckay impressed with his bowling as he picked up 4 wickets and he was the only bowler from Kiwi side who looked like picking up wickets. New Zealand started their innings steadily till 7 overs in reply to India's score of 273. Guptill opened with Jamie How. Guptill played some gorgeous shots. On the other hand Jamie How was playing cautiously but Nehra strike in 7th over and picked up How by bouncing him. Soon after the fall of How, Guptill played rash stroke in the over of Ashwin and lost his wicket. 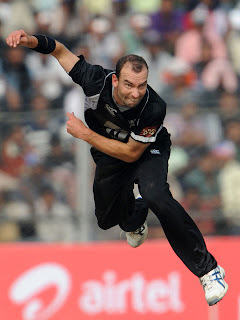 Ross Taylor was joined by Williamson and they steadied the ship for Kiwis but at crucial juncture Williamson got out and after Williamson's departure Kiwis lost wickets at regular interval. Hats-off to Indian bowlers who displayed great skills on little-bit responsive pitch and kept Kiwis under pressure. Yuvraj Singh was exceptional in bowling, he was economic and also picked up 3 crucial wickets. In the end Mills and Nathan McCullum played few shots and created some tension in Indian camp but Sreesanth came into the attack and ended the Kiwi innings and India won this match by 40 runs. I feel if India continue this kind of performance in coming matches them I feel they have great chance to win the series but it is too early to say so because Kiwis have the capability tocome-back and win the series. Remember they were not full-strength in this match as Vettori and Brendon McCullum opted to rest because of injury. I must advice Team India, not to get over-confident after this match and have to take one-match at a time rather than thinking about entire series. Gambhir was good in his first outing as captain and batted freely which is good for him and the team. He was pro-active in his approach and I hope he continue same way in the coming matches.